Evie Rosen has been connected to her smartphone and computer for too long. When she realizes that her obsession with the internet has caused major problems in her career and love life, she gives it up. She soon finds that being completely unplugged in today's world isn't easy but it changes her perspective on life in a positive way. 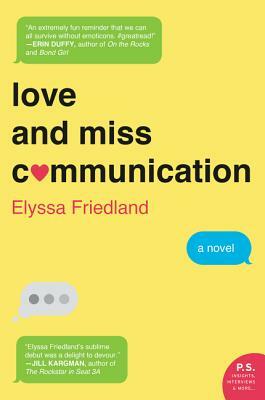 Love and Miss Communication by Elyssa Friedland is a fun summer read. Evie is an interesting character ~ a lawyer who is rethinking her career and trying to find her passion. She's also recovering from a harsh break up with a man that she hasn't quite gotten over. This is a bit of a problem when she meets a new man who could be Mr. Right. I enjoyed this modern love story a lot. It's lighter than many of the novels I read, but that's perfect for summer. The romance was fun and realistic, although Evie's obsession with her ex was a bit too much. I won't say it was unrealistic, as I'm sure there are women who obsess about their exes as much as Evie does. But it was frustrating at times, even though it added a good bit of conflict to her new relationship. I wanted to slap her and tell her to get over it! The idea of unplugging completely is compelling but Friedland points out the problems with this as well: missing important invitations that are sent only by email these days and the baby pictures everyone posts online. The world really does revolve around everyone being connected and online at all times. Love and Miss Communication made me think about this and consider whether this is a good thing or a bad thing. If you're looking for a fun romantic novel that makes you think, check out Love and Miss Communication. This review was written based on a copy of Love and Miss Communication that I received from Wunderkind PR in exchange for an honest review. I think this one will hit home with a lot of people!!! Just pinned it to my list of books to read. Thanks for the recommendation. I know a couple who just unplugged. Added to my reading list to see what she learns. I really need to unplug to some extent myself. I don't think I could completely unplug like she did, though! This looked like a good read. I'm glad you liked it for the most part. Can't imagine unplugging but hoping to give it a shot when we're traveling next month! Try it! I did when we were out of the country for a week and it was kind of nice. I checked email once a day and that was it!